Was Last Night’s Time Change a Mistake? Having happily enjoyed an extra hour of sleep, I just returned to standard time. So too did more than 300 million Americans in every state except Arizona and Hawaii. But should we “spring forward” next March? With the energy savings of daylight-saving time (DST) having been pretty much debunked, the other reason for the time switch is shopping. To see if more daylight increases consumer spending, the JPMorgan Chase Institute compared 350 million transactions in Los Angeles and Phoenix. Because LA does the DST/standard time switch while Phoenix does not, researchers believe they have some causation evidence. Because the data reflects fewer transactions, the number of trips to the store has probably decreased. The biggest losers though were groceries while restaurants were minimally affected. Researchers hypothesize that the reason was less daylight. They do note that the numbers differ when San Diego and Denver were each compared to Phoenix. However, all three data sets confirm that DST does not have a consumer spending benefit. In different ways, consumer spending and productivity are both crucial for our economy. As 70% of the GDP, what you and I spend sustains current economic output. 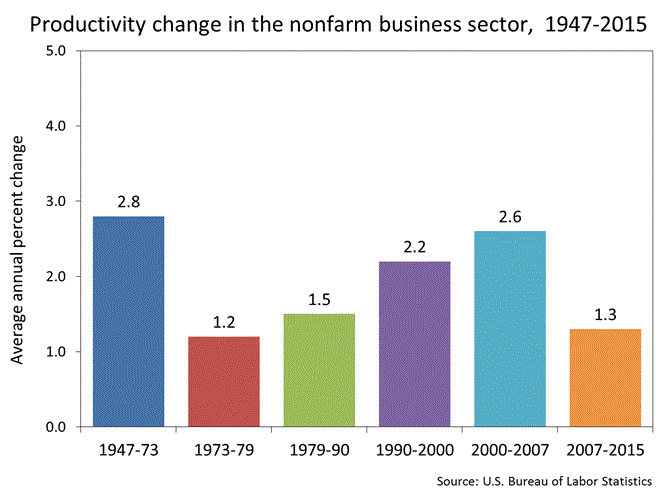 However, productivity is what propels growth. My sources and more: WSJ always has a good DST article and alerted me to the JPMorgan Chase Institute report.